New Age Metals Inc. (TSXV:NAM; OTCQB:NMTLF; FSE:P7J.F) Harry Barr, Chairman & CEO, stated; “The company is pleased to update our shareholders with the new amended May 2018 NI 43-101 Mineral Resource Estimate of the River Valley Platinum Group Metals (PGM) Project. – The amended January 9, 2019 NI 43-101 Mineral Resource Estimate confirms that the River Valley Project has 2,867,000 Measured and Indicated PdEq ounces, with 1,059,000 PdEq ounces in Inferred at a 0.35 g/t and 2.0 g/t PdEq cut-off for open pit and underground respectively. – The amended and restated Mineral Resource Estimate presents a Mineral Resource that demonstrates reasonable prospects for eventual economic extraction. – The new pit constrained Mineral Resource will be more representative of the potentially economic portion of the Mineral Resource that will be disclosed in the upcoming 2019 Preliminary Economic Assessment (PEA). – River Valley is the largest undeveloped primary PGM Mineral Resource in North America. The Project has excellent infrastructure and is within 100 kilometres of the Sudbury Metallurgical Complex. The Project is 100% owned by New Age Metals. – The Project’s first economic study (Preliminary Economic Assessment) is slated to be completed on or before the end of Q2 2019. 1.CIM definition standards were followed for the Mineral Resource Estimate. 2.The 2018 Mineral Resource models used Ordinary Kriging grade estimation within a three-dimensional block model with mineralized zones defined by wireframed solids. 3.A base cut-off grade of 0.35 g/t PdEq was used for reporting Mineral Resources in a constrained pit and 2.00 g/t PdEq was used for reporting the Mineral Resources under the pit. 4.Palladium Equivalent (PdEq) calculated using (US$): $950/oz Pd, $950/oz Pt, $1,275/oz Au, $1500/oz Rh, $2.75/lb Cu, $5.25/lb Ni, $36/lb Co.
7. The Inferred Mineral Resource in this estimate has a lower level of confidence than that applied to an Indicated Mineral Resource and must not be converted to a Mineral Reserve. It is reasonably expected that the majority of the Inferred Mineral Resource could be upgraded to an Indicated Mineral Resource with continued exploration. NAM’s flagship project is its 100% owned River Valley PGM Project (NAM Website – River Valley Project) in the Sudbury Mining District of Northern Ontario (100 km east of Sudbury, Ontario). See results from the most recent NI 43-101 Mineral Resource update above in Table 1. NAM management and consultants are currently designing a complete drill program to be executed in 2019 for the River Valley Project. This plan will consider previously proposed drill parameters and will be based on the most recent geophysical assessment and consultant expertise. The projects first economic study, a Preliminary Economic Assessment (PEA) is underway and is being overseen by Mr. Michael Neumann, P.Eng., a veteran mining engineer and one of NAM’s directors. 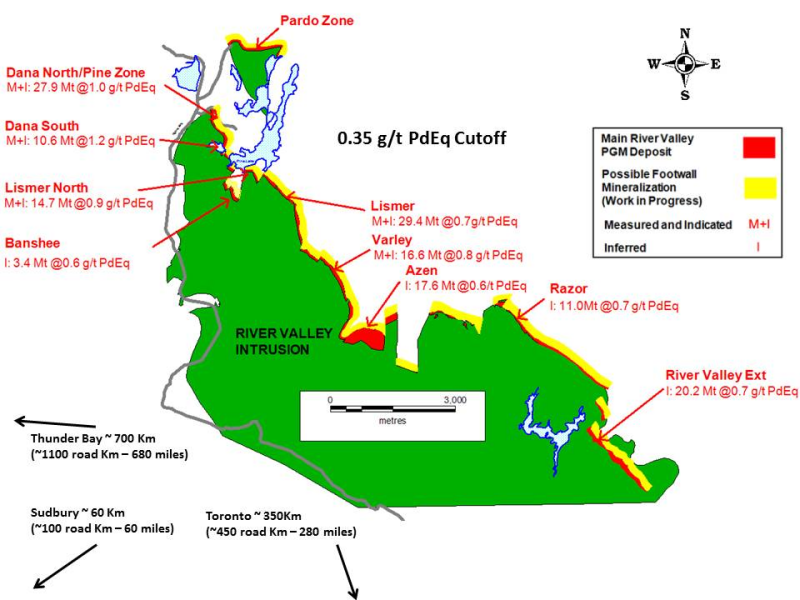 See the most recent press releases for the River Valley Project PEA which details the appointment of P&E Mining Consultants Inc. and DRA Americas to jointly conduct the study, dated July 25, 2018and August 1, 2018 respectively. Our new Fall Chairman’s message can be accessed at our website (www.newagemetals.com) .